The time required for a scan is variable according to the person. After entering personal details, the exercises take approximately six minutes to perform. Variations that result in longer time are, when movements need to be repeated, re-tests are performed using ‘Exercise instruction video’ and when an individual answers surveys (eg. mood survey) after the scan and/or feedback. Before starting a scan, there are various requirements by the health service provider and the health seeker. Enter login details to authenticate an active subscription. 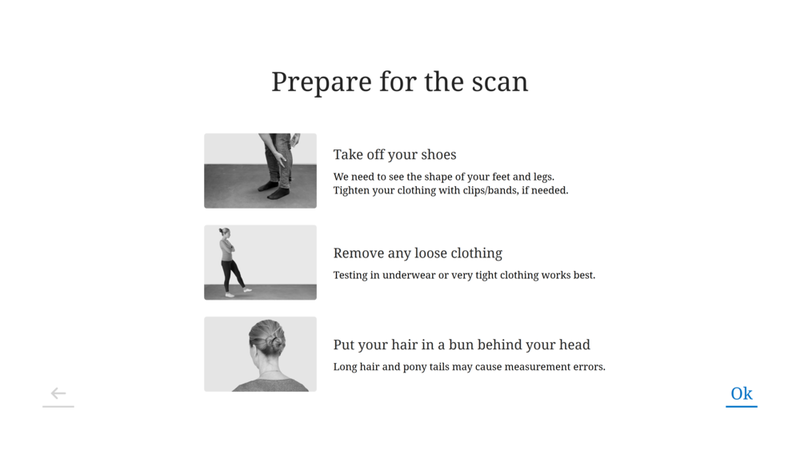 Scanners, Advisors and Analysts can perform scans if an organisation’s Administrator has given them rights to start Posture Scan. Each time software is started, it is necessary to calibrate the floor. Calibrate the floor again each time the sensor is moved, or the software is closed and restarted. The first screen experienced by the test person. They can proceed with the scan independently from this point onwards. Some personal details are required before the actual recording of movement begins. In the event changes to Settings are required, the toolbar can be accessed by clicking ‘Esc’ on the keyboard. Otherwise, touch the screen to continue. Enter an email address or Personal Identification (PID) so that the test person can be identified in the future, and past scans can be retrieved. The PID is for the individual who is doing the scan and not the address of the Provider. Please choose a unique and memorable PID. This typically an email address, person number, tax number or membership number.Email addresses are not shared with third parties. The test person is asked to check the email address and confirm that the spelling is correct. If the spelling is incorrect, press the back-arrow key make the relevant changes on the previous screen. Repeat the process and press OK to continue. Personal details allow a comparison with other people. 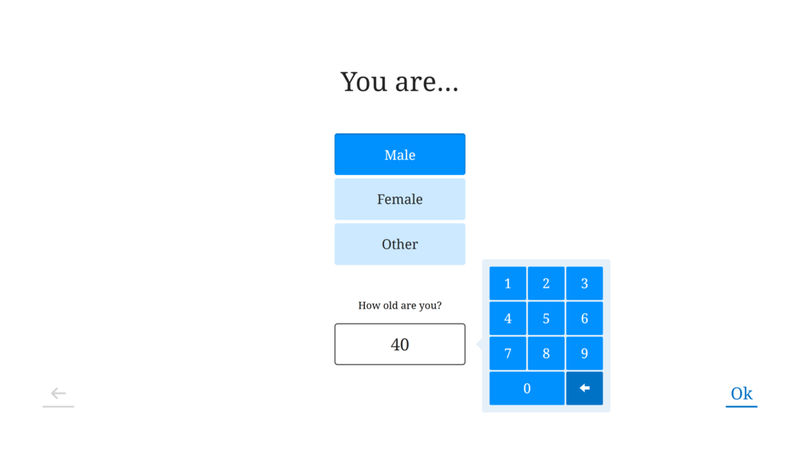 For example - gender and age. Enter weight in kilograms. Weight is important for calculating body mass index (BMI), a measure often used by doctors and researchers. The preferred limbs used to perform major actions. Indicate if there is any mild or severe discomfort in the body, and if there is a history of falling in the past year. This would ensure that the individuals are given exercises which they can do. If the indivudual expereicnes no discomfort the process would skip to step 14. Once discomfort is indicated under the pain reporting, body chart screen will ask for general locations of pain. Press on the body parts where discomfort is experienced. The body chart is not specific to the front or the back of the body. Based on the discomfort location and if the person had a fall, the individual is asked to verify that they can safely perform a single leg squat on each leg. This is to prevent any injuries occurring during the scan. The test person should practice each exercise and choose if they can do the scan voluntarily, and on their own without assistance. Instructions about how to prepare for the scan to ensure accurate recorded data. It is best to scan in tight underwear, however this may not always be possible. More details about conditions for suitable clothing can be found here. 1. ‘Practise each movement with the instruction video’. The person will first see an instruction video to explain what movements are expected of them. They are asked to practice along with the video. This helps to improve the repeatability of testing. The instruction video will show the movement as though looking at a person through a window. The instructor’s left will be the test person’s left. However, when the person performs the test, the image on the screen will be like looking in a mirror. The video’s left will be the test person’s right. This is a characteristic of the kinect sensor, and cannot be altered. 2. ‘Nod when you are ready to perform a test’. This screen explains that the person must nod their head to trigger the recording screen of the exercise. Copy the exercise on the screen as though looking in the mirror. If the system recognizes an email address it assume that the test person has done a scan in the past. If the person can remember the instruction videos from the previous test, they are given the option to do a faster scan, without demonstration videos. They simply follow the video that accompanies the recording mode. To avoid irregularities, it is recommended that individuals use the demo video option. Testing will begin after the safety message. The person presses begin scan. A person should be able to ask for help or assistance if they cannot perform a task. The test person is asked to move to the green box, seen on the screen. The software assumes that the individual has walked away from the screen, so the voice volume increases. Suitable clothing needs to be worn by the test person, otherwise an error page will appear. If the clothing is suitable, the scan will begin. If the clothing is not suitable, then a red shadow will appear on the rejected items. They need to be removed or covered, to proceed. Each exercise starts with a demonstration video. It will explain how to stand and how to perform the exercise. The test person is asked to copy the demonstration video, so that they have practiced. This helps to minimize the influence of a training effect on scan data. The test person is asked to nod their head to initiate a recording using Gesture recognition. The screen is initially blue, with the subject’s head in a circle. Performing the nod at the right speed and depth will fill the screen with green colour, and the instructional video and recording will be triggered to start. A successful nod or voice activation will make the blue screen turn to green, and the recording will begin. 3D movement data is recorded along with the instructional video. The test person simply copies the instructions as though looking in the mirror, with the same timing and technique. There are 7 simple exercise of standing still, side bending, double leg squat, single leg balence and single leg squat. When the exercises are completed, the test person is requested to approach the screen to view the scan results. Several options are available at the end of the scan, depending on the Settings defined by the Provider or the Administrator of the Organisation. The feedback screen would creates instant animated feedback about the performance, with simple key measures, and an audio description. For feedback to follow the scan, the feature has to be enabled within the settings. Options to perform actions depending on Settings customised by the Provider or the Administrator. The options include Send/Share/Print a Summary Report, and/or Open Movement Lab, and Exit. After the physical test, there is an option to complete a survey. MADR-S survey is used measure mood and risk of depression. Upon completion of the all the scan at a given time, remember to logout from the application, to avoid data leakage and unauthorised use. Click on ESC and then log out by clicking on the user account name and then logout.